The Parramatta Waldorf Apartment Hotel is a prestigous and stylish 4.5 star modern contemporary accommodation property setting new standards of modern contemporary spaciousness.Ideal for the discerning leisure and corporate business guest alike, the Parramatta Waldorf Apartment Hotel offers studios and 1 bedroom self contained apartment accommodation for short or extended stays. Conveniently located opposite Rosehill Gardens Racecourse, in the heart of Sydney's growing West, The Parramatta Waldorf Apartment Hotel is within close distance from The Parramatta Central Business District. The Parramatta Waldorf Apartment Hotel is close to everything that Sydney has to offer and features numerous guests facilities including lounge bar, disabled facilities, faxing facilities, free car parking, guest laundry, gym & fitness equipment, lift, restaurant, room service, spa, outdoor swimming pool and 24 hour reception. The Parramatta Waldorf Apartment Hotel also caters well for business corporate clients with wireless internet and data port in each studio and 1 bedroom apartment, photocopying service, faxing facilities and extensive meeting/conference/function facilities. 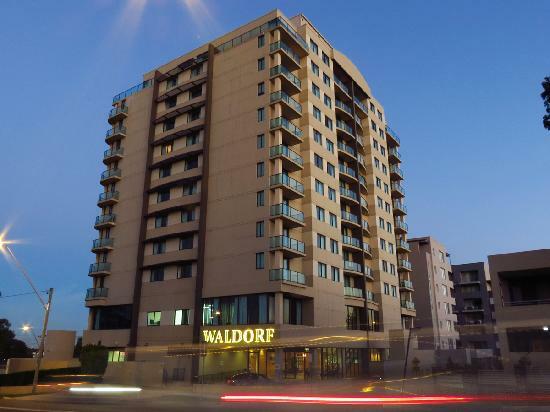 The Parramatta Waldorf Apartment Hotel - luxurious and affordable self contained hotel apartments accommodation for business, leisure travelers and families in the heart of Parramatta. Nearby Attractions : Ideally located opposite Rosehill Gardens Racecourse, in the heart of Sydney's growing West, The Parramatta Waldorf Apartment Hotel is within close distance from The Parramatta Central Business District. The Parramatta Waldorf Apartment Hotel is superbly located for both business or leisure as it is close to Parramatta City's major shopping precint, government offices, business and financial district, all within easy walking distance, Nearby attractions include Rosehill race course, Sydney Olympic Park (Homebush), Elizabeth Farm (built 1793), Hambledon Cottage (built 1824), Burnside Heritage Centre (built 1911), Gateway Art Gallery (built 1887), Parramatta Stadium, a major sport and recreation venue and the home of The Parramatta Eels, Parramatta Riverside Theatres, Parramatta Heritage Centre and Church Street's Mall. The Apartment hotel is within easy access to Homebush Bay Olympic Stadium, Sydney Showground & Exhibition Centre, Australia Wonderland Theme Park, Parramatta Stadium, Elizabeth Farm, Featherdale Wildlife Park, Linden Museum, Lanter Barracks and Eastern Creek Raceway and on an easy access route for daily or weekend visit to The Blue Mountains outside Sydney Western suburbs. The Sydney Central Business District is a quick 20 km away via the expressway while Sydney International Airport is 30 Km away, Rivercat service to Circular Quay, Star City Casino and many other Sydney attractions is located within 1500 m from the apartment hotel. 1 Bedrm Queen/Twin Apartment : Sleeps up to 4 guests on 1 Queen Or 2 Single Beds + Double Sofa Bed..